It’s extremely hard to believe that some of these luxury properties exist, the architecture and building structures can be so complex that them staying up and being habitable seems impossible. Large corporate company owners, A-list celebrities, royals and descendants of highly influential business owners all come under the sort of people that are the owners of these incredible masterpieces. Ranging from a few million to over £1 billion there are a variety of different structures and qualities within some of these properties. There are too many luxury properties around the world to list them all, but we’ve taken the time to list some of the most expensive and unique properties around the globe. So if you want to see some luxury real estate, then keep reading! Top of our list has to be one of the most incredible luxury properties built to date. Not only are it’s features incredible, but it’s building structure makes it questionable how this property stays firm on the ground. This 27 storey super mansion is owned by Mukesh Ambani, an incredibly well known and successful businessman. Located in Mumbai, you can spot the Anitlia residence from miles away; it features 3 helipads all on top of the property. Boasting 1178 rooms and 257 bathrooms this property takes a whopping 600 staff members to run and look after everything. As well as this, there are 9 elevators to take guests from floor to floor, although 6 out of the 27 storeys are dedicated to car storage. Home to the most renown figures in Britain, Buckingham Palace is one of the most expensive buildings in the entire world. Home to Queen Elizabeth II as well as the rest of the royal family, Buckingham palace was constructed in 1703, making it one of the most historic buildings in England. Valued at £1.5 billion by the Nationwide Building Society, Buckingham palace certainly takes a high title in the most luxury properties around the world. Featuring 775 rooms in total complete with 188 staff rooms, 52 guest and royal bedrooms, 78 bathrooms, 19 staterooms and 92 offices it’s apparent that the royal family boast one of the most spacious properties in the world. Another property based in the heart of London. Knightsbridge is known for its streak of millionaire properties. 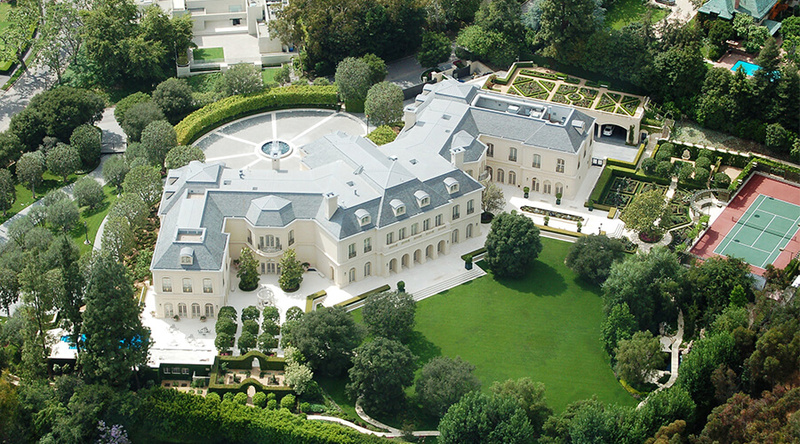 Owned by the owner of Capital FM Ashley Taboor, a massive £120 million was forked out for this stunning property. It was even the most expensive purchase of a property recorded in the UK by the Land Registry. Ashley Taboor’s plans were to knock through the walls of his Knightsbridge home to the adjacent flat he also owns to make one 15,000 square feet super flat. Although there have been a few flaws in his plans and whether or not he is able to go through with the large-scale project is questionable. Home to the A-list super couple Beyonce and Jay Z, 454 Guestaway in Los Angeles is a property that stands out from the rest. Forking out an incredible £90 million for this modernised new build in Bel Air, it has modernised updated features to match its astonishing architecture. The overall home is composed out of 6 different buildings, complete with a car garage that can hold up to 15 vehicles, as well as its own helipad and bulletproof windows. This property has extended safety features to house Beyonce, Jay Z and their 3 children and was designed by the renown architect Paul Mcclean. Located in the American countryside of Aspen Colorado the Hala Ranch comes in at a hefty £135 million. Owned by billionaire John Alfred Paulson the hedge fund manager and head of Paulson & Co the Hala Ranch is one of the most beautiful properties around. Originally sold on by the Saudi Prince Bandar Bin Sultan this property comes with a total of 15 bedrooms and 16 bathrooms. As well as this it has a number of side rooms with additional high-tech features, such as a water treatment plant, a gas pump and much more. New York has always been home to many overly lavish properties, but 432 Park avenue has to be one of the most renown. Last year a Chinese buyer purchased 3 of the most luxury penthouses in the Park Avenue building. In total these span a massive 11,906 square feet over 2 floors of the apartments. This beats the previous most expensive penthouse purchased, brought by a Saudi billionaire names Fawaz Al Hokair who forked out for the top penthouse in the entire tower block. Built for famous TV producer Aaron Spelling and his wife Candy in the late 1980’s, this manorhouse weighs in at a price of around £200 million. When this property was built, it was constructed with a variety of strange purposed rooms in mind. Rooms such as a barbers, a room made specifically to store Candy’s extensive doll collection, a flower-cutting room, a basement bowling alley and even a room dedicated for storing their shoe collection. Since being brought from Aaron Spelling the home now has more modernised property features such as a gym, a wine cellar and tasting room and even it’s own in-house nightclub. When the property was first constructed, many of spellings neighbours filed complaints to try and reduce the size of the mansion as well to limit the amount of construction – which then resulted in spelling having to reimburse a number of neighbours for property damage. In total this property has a staggering 122 rooms in total and is amongst some of the largest American properties – although it is far from the top spot. Although it’s highly unlikely you will be able to tour a celebrities house without any legal permission, there are hundreds of incredible properties around the world that you can visit that mimick some of these homes. Why not spruce up your home with home extensions Buckingham? Our builders Milton Keynes can aid you in creating the property of your dreams, we supply architectural work and can tailor our services to the plans for your perfect home.